Boom’s booming business; Nadal in Cebu? Will Rep. Manny Pacquiao get to fulfill his goal of meeting Pres. Barack Obama? Let’s see. Let’s hope so. For if it happens, what a dream photograph moment for MP. Everybody wants a picture with Obama. (Remember GMA?) I hope Pacman gets his Oval Office wish. SUPER. Apart from the half-time show, the Dallas Cowboys cheerleaders, the fireworks and the actual Steelers-Packers game, the Super Bowl is known for another contest: Advertisements. Each Super Bowl TV ad costs a monstrous $2.6 million. Computed in pesos, per 30-second advertisement, that’s P113,282,000. PALARO. DepEd has released details pertaining to the complaints raised about the Palarong Pambansa selection for Region VII: “Only basketball, football, baseball, sepak takraw, softball and volleyball will conduct evaluations.” This is both good and bad. Good because the rest of the athletes (individual sports) will no longer undergo the confusing “performance evaluation.” Bad because, until now, nearly three months after the Cviraa in Dumaguete City, the final composition of the above-mentioned ballgames has yet to be completed. BOOM. 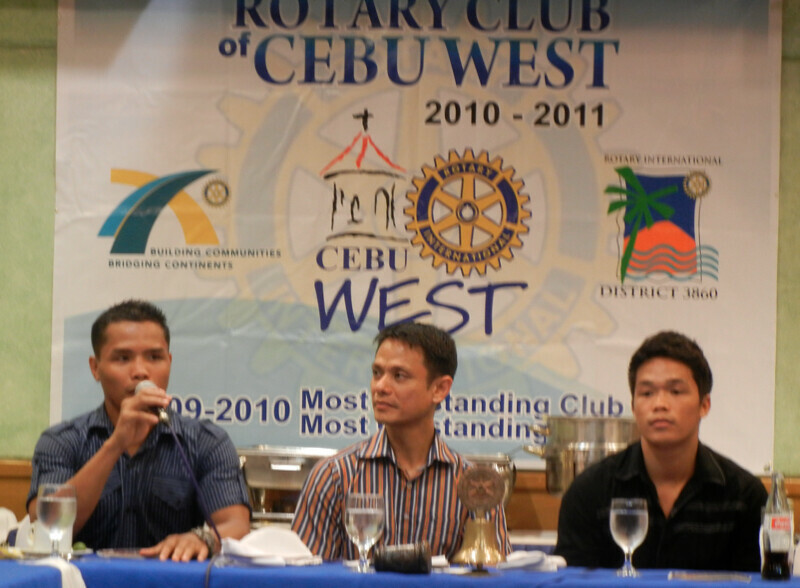 Rey Bautista and Jason Pagara were our guests last Tuesday at the Rotary Club of Cebu West meeting at the Cebu Country Club. With at least five mega-events organized by the ALA Promotions this 2011—plus, of course, the global power of a certain congressman from Sarangani—Philippine boxing is at its peak today. Staying up past 10:30 p.m. two nights ago with Boom-Boom, Jason, Chad Cañares and Edito Villamor at the Frostbite Dessert and Yoghurt store (along Juan Luna Ave.), what impressed me most about Boom-Boom was his business acumen. Not wanting to throw his money to waste, he explained to our group (Justin Uy, Johnny Siao, Nilo Domingo, John Young, Camilo Ceniza, Dr. Benjie Cimafranca) his “Booming” venture. He bought several passenger vans and has an expanding V-hire business in Bohol. Plus, during times when he’s available, he drives the van himself–complete with a side-trip tour of his home in Candijay, Bohol. Impressive, Boom-Boom! NBA. Can you believe the strength of a Carmelo Anthony-powered L.A. Lakers? Rumors are swirling that Andrew Bynum will be traded for the Denver Nuggets superstar. Wow, if that happens, the Anthony-Bryant-Gasol trio will not only rival the Three Kings of Miami—it will also be hard to imagine any other NBA final but the Lakers-Heat. The Cavaliers? Ouch. Don’t you pity Cleveland? Like a groom left at the altar by a bride who sped away minutes before the “I do’s,” LeBron’s former team has lost 25 straight games. Their standing is 8-44. NADAL. After his rival Roger Federer won the Laureus Sportsman of the Year award from 2005 to 2008, it’s now Rafa Nadal’s turn. (The past two years were won by Usain Bolt.) In a ceremony in Abu Dhabi, the 24-year-old Spaniard was conferred the trophy. “For me, the most important thing is not being No. 1,” said Nadal, “but to be healthy and keep being competitive in every tournament I play.” Wise words. For someone who plays an all-out physical game that endangers his body, Nadal’s strongest opponent is not Roger, Novak or Andy—it’s the expected breakdown of his body. Speaking of Spain, would you believe that, if we win the Davis Cup tie against Japan this March 4 to 6 in Lapu-Lapu City… and then we win the next one against either New Zealand or Uzbekistan… then we have a chance to play Rafa? I’m not joking. We are two Davis Cup victories away from joining the highly-prized World Group (top 16 nations including France, U.S., Switzerland…). The last time we entered that group was back in 1991. I flew to Manila and watched Felix Barrientos and Roland So at the Ninoy Aquino Stadium battle against Sweden (whose star, Stefan Edberg, opted not to join; Sweden still won 5-0). It’s a long shot but… you never know. (If the Azkals can do it…) And speaking of dreams: imagine if we beat Japan, beat NZ/Uzbekistan, draw Spain… and the Davis Cup against Nadal is played in Plantation Bay!